Buckwheat Waffles - Do You Know The Muffin Man? 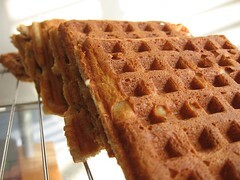 Notes: This recipe uses baking soda and buttermilk so the waffle batter is quite foamy. They have a strong buttery taste which I found too overpowering.